Monument Circle is the heart of Indianapolis. The Soldiers and Sailors Monument is dramatic, with its overwhelming scale and lavish sculpture, and the buildings lining the circle provide a rich backdrop with their own sense of place and beauty. In 1821, Alexander Ralston did not specify land uses in his plan for the circle, other than for the center of the circle, which was to be the governor’s residence. Until the 1860s, many lots on the circle were owned by churches. Congregationalists, Presbyterians, Methodists, and Episcopalians all built simple frame chapels facing the circle. 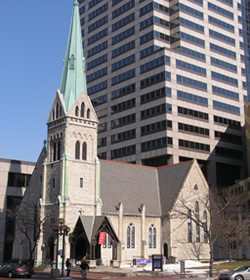 Only the Episcopal church remains today; Christ Church Cathedral is a stone Gothic Revival sanctuary dating from the 1860s. Gradually, the congregations found their members living farther and farther away, with office and commercial uses crowding out their church buildings. Merchants bought up the church sites. Contractors began construction on the State Soldiers and Sailors Monument in the 1880s, and in time, its limestone obelisk rose above its surroundings. The completion of the monument in 1902 made the circle a civic space. The circle’s gradual transformation into a business, commercial, and civic core was complete. Architects of several generations have had to contend with fitting their design concepts into a concave footprint to match the radius of the circle. Early architects chose to ignore the radius and placed conventional buildings at a tangent to the circle. By the 1870s and 80s, however, the freedom of expression that came with cast-iron fronts allowed builders to warp façades easily. One of the best remembered buildings on the circle, the English Hotel, filled a quarter-radius of the circle with its Italianate/Queen Anne façade. The English Hotel succumbed to progress after World War II. A Penney’s store replaced it with a Modernist curving blank limestone curtain wall. Eventually, Penney’s vacated the store, and a Postmodern façade now fills the northwest quadrant of Monument Circle. Indiana limestone became the most popular building material for the new generation of buildings lining Monument Circle. The Guaranty and Test Buildings, both from the 1920s, occupy portions of the southwestern quadrant. These two show the refinement and quality of Monument Circle’s architecture, with their curved facades, tasteful Neo Classical design, and respectful height that allows the State Soldiers and Sailors Monument to stand tall. The Test Building also features sculptural panels. Other buildings on Monument Circle have public art: Circle Theater, with its terra-cotta frieze and mural over the marquee; the Columbia Club with its sculpted panels; and Circle Tower’s intricately cast neo-Egyptian brass screens set in the main entrance arch. However impressive, the technological innovations of 1920s architecture raised concerns. Would Indiana’s revered c. 285 tall State Soldiers and Sailors Monument, completed only two decade before, be cast into shadow by steel-framed skyscrapers? In 1921-22, local architect William Earl Russ and city leaders proposed, and the city implemented, local legislation that limited heights to 10 stories and called for elevation setbacks to preserve the prominence of the monument. George Edward Kessler had made the initial suggestion to the city during his years as a consulting park planner. 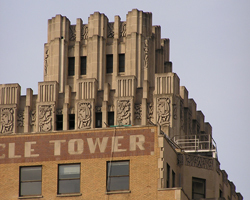 Circle Tower, with its Deco stair-step roofline, is the most obvious example of how the legislation shaped architecture on the circle. The Emmis Building, completed in the 1990s, also reflects the setback design concept. Attempts to beautify Monument Circle took shape after the war years in the late 1940s. Architect Edward Pierre was a leading home, business, and civic designer in Indianapolis in the 1920s and 30s. Pierre, then near retirement, made suggestions about revitalizing the circle. Among others, he recommended that Monument Circle and the Monument itself be strung with holiday lights. Thanks to his idea, visitors lucky enough to be in downtown Indianapolis during the holidays will experience the magical effect of the lighting. The City of Indianapolis hoped to improve the image of the circle in the 1970s. Workers laid paving bricks on Monument Circle and Market Street and installed brick walks. Names of donors to the project were inscribed on the sidewalk bricks. In the 1970s, the downtown was developing into a sports destination, with the Indiana Pacers playing at the then-new Market Square Arena. The Indiana State Museum was downtown in the Old Indianapolis City Hall, but the downtown lacked other major cultural draws. In the early 1980s, city officials lured the Indianapolis Symphony Orchestra downtown to the old Circle Theater, turned into a fitting home for the symphony, thanks to a multimillion dollar restoration. Today, Monument Circle more than fulfils the civic ideas Alexander Ralston had for Indianapolis.